What is it about the ocean that captivates us? Perhaps it’s due to the fact that, as you know, the ocean covers more than 70 percent of the Earth’s surface and yet, so much remains unseen, uncharted and unexplored. Luckily, the Maldives – with its azure Indian Ocean waters – provides a rather extraordinary starting point for nautical exploration with some of the world’s most unique experiences to see, sleep, relax, eat and drink underwater. Stationed almost six metres below sea level, 5.8 is the world’s largest all-glass underwater restaurant and a meal here is likely to stun any dinner date. The dome-shaped restaurant is located in the luxury Hurawalhi island resort and presents sweeping views of sea life that call the coral reefs home. A seven-course menu including seafood-inspired dishes such as seared scallop served with prawn coconut bisque and pea mousse offers theatre on the plate, while shoals of tropical fish lend themselves to the enthralling backdrop. Subsix, dubbed an ‘underwater playground’, is the kind of bar that earns you bragging rights for partying ocean deep. Situated 500 metres off-shore from the main island of Niyama and accessible only by speedboat, this subterranean restaurant, bar and nightclub is a must for the underwater itinerary. The impressive interior is centred around the sea, reflecting ocean elements including coral-like chandeliers, a ceiling draped with capiz shells and a clam-inspired bar. And as the ocean inhabitants dance across the sea floor, so can guests, with live DJs and underwater glow parties that commence in the evenings. A new experience for both art and environmental enthusiasts has recently emerged in the form of Coralarium; the world’s first semi-submerged art gallery. Created by acclaimed British artist Jason deCaires Taylor, the underwater sculpture museum is just a short swim away from Fairmont Maldives Sirru Fen Fushi in which guests can participate in guided tours led by the resort’s resident marine biologist. The artwork itself comprises of nearly 30 hybrid form (part-human, plant and coral) sculptures that are based on the endemic species of the island in a bid to raise awareness for the protection of Maldivian coral reefs. Sinking into relaxation is not difficult in the Maldives, but we can sink a little deeper – 8 metres deeper into the Indian Ocean in fact – to the world’s first underwater spa. Pearl is located at Huvafen Fushi and offers treatments in opulent undersea rooms that boast views of the exotic marine life to relax in. We have our hopes set on rejuvenating massages from highly-trained therapists to cure jet lag and encourage deep sleep; along with couture facials from renowned skincare expert Teresa Tarmey to uncover younger looking skin. 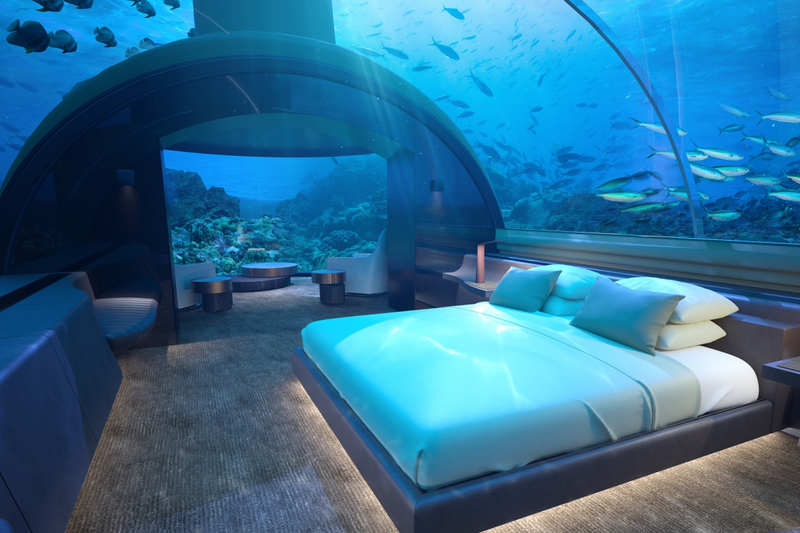 Set to open in November this year, The Muraka – believed to be the world’s first undersea residence – will introduce uninterrupted views of the surrounding sea life while you sleep. We’re excited to see the US$15 million villa which will be nestled 5 metres under the Indian Ocean and span two levels with an underwater suite featuring a king-size bedroom, living area and bathroom; while the upper level incorporates a twin-size bedroom, bathroom, gym, living room, kitchen, bar and even an ocean-view bathtub and sunset-facing deck complete with infinity pool.